This hearty soup is a definite go-to when the weather is chilly and blustery and you need something to warm your soul. Sweet carrots, salty ham, and tangy ale balance the earthy flavor of split peas perfectly. In a large 6 to 8-quart pot, heat the butter over medium heat until melted. Add the onions, carrots, and celery and cook, stirring often, until the vegetables are beginning to soften, about 5 to 7 minutes. Add the potato, ham hocks, split peas, beer, water, thyme, and Dijon mustard and stir well. Bring the mixture to a boil over medium-high heat. Reduce the heat to medium low and simmer, uncovered and stirring occasionally, until the ham and peas are very tender, about 2 to 2 1/2 hours. Remove the pot from the heat. Transfer the ham hocks to a large plate and let cool. When cool enough to handle, remove and discard the bones and skin, and cut the meat into bite-size chunks. Return the meat to the pot. Stir the vinegar into the soup and season to taste with salt. Reheat the soup over low heat, stir occasionally, and serve with some crusty bread. 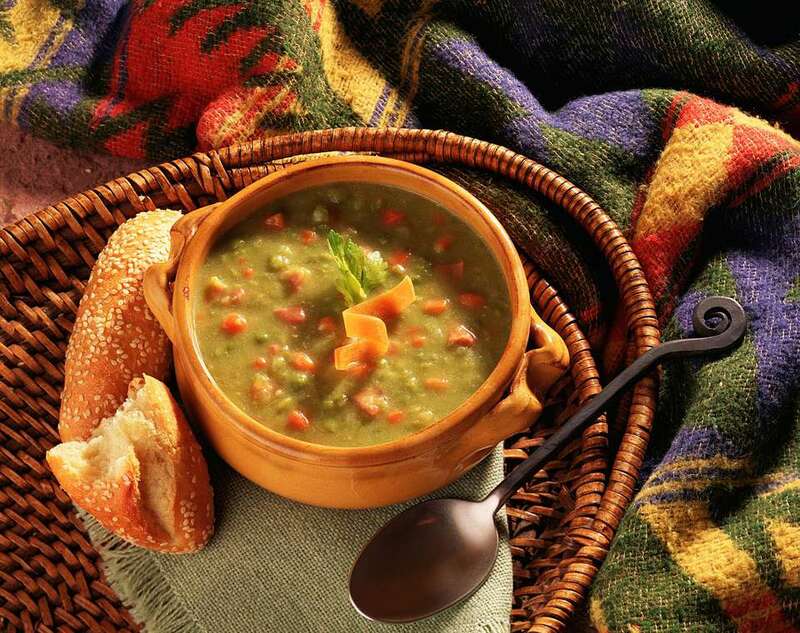 You can refrigerate any leftovers of the split pea soup in an airtight container for up to 5 days, or freeze up to 3 months. Defrost the soup overnight in the refrigerator. Look for smoked ham hocks in the meat section of your grocery store. You can substitute 1 large meaty ham bone for the hocks. Split peas are a type of pulse, and come in green and yellow varieties. They do not require pre-soaking before using. Store dried split peas in an airtight container at room temperature for up to 1 year. Before using dried split peas they should be rinsed well and picked through to remove any pebbles.